Blogged up! : World visitor widget for blogger. 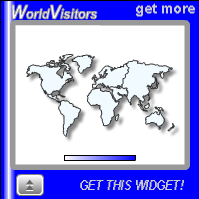 World visitor widget for blogger. Time for another blogger widget guys. I am writing a new post after long time and must say i am feeling so.................fucked up! Well that was the right word. Oh i forgot to say, i got my visa for Australia recently and i am moving there in the first week of July. Oh, thank you so much(i can hear you saying congratulation!) okay lets go back to widget. This widget tracks the country of our blog readers and shows them in your sidebar. This world visitor blogger widget which initially comes in blue is useful widget if you want to track the country of your blog visitor. This widget shows the country of your visitor in the format of world map. This world visitor blogger widget is really fun if you too love to see the country of your reader like me. well, i found this widget in widgetbox and thought it will be really great if i share it with you. so if you are looking for a cool visitor widget then this blogger widget may not disappoint you. You can also try other blogger widgets like Top commentator widget or Multiple search engine widget for blogger. looks diffrent in my blog (http://lexmove.blogspot.com/).